Imagine the scene given to us in our psalm for today. Here is a nice, pretty pastoral picture. Fields of fresh green grass, cool stream of gentle water, happy little sheep grazing, drinking and napping in this picturesque landscape. A shepherd standing by, watching over the little lambs with all things bright and beautiful. We can almost hear a lullaby in the background. Serene. Peaceful. However, is that serene image, comforting as it can be, all that there is for us in this psalm? Is there more here for us to learn? There is a point where this becomes for us merely docile sheep lazing away time in a field safe from all harm looked over by a benevolent herder. It can become a cliché image we associate with pale and insipid greeting cards or an overused sentiment that eventually becomes hollow. But this psalm could also tell us something more about God and more about what it means to follow the Lord, our Shepherd. The 23rd psalm was written during a period of exile for the people of God. It was a time when life was frightening and it may have been easy for them to feel as if God had left them entirely. They were far from home. Life was different from how it had ever been. There were lots of dark shadows, lots of enemies, and a deep need to know that God was still with them in the wilderness of their exile. This psalm was written as a song of praise to God as a shepherd of God’s people, but a shepherd meant much more than a herder of animals. If we read this Psalm and stop with this vision of placid fields and still waters, we are perhaps getting only part of the picture. During the time that this psalm was written, the people looked to their rulers to lead and shepherd them. Not necessarily very different from today or from what we often expect of most of our leaders but we don’t really like to think of it that way. We expect our leaders to be responsible, wise in the ways of the world, wary of the attack of those who would harm us, protect us at all costs and lead us into a time of comfort, safety and prosperity. So, when the writer said ‘the Lord is my shepherd’ he was likely saying more than ‘I am a sheep’, but also ‘the lord is my king, my ruler, the one who leads, guides and protects me’ When we start the psalm with this idea, it may give us a new perspective. The writer says ‘I shall not want or lack for anything. The Lord makes me lie down in green pastures, by still waters, restores my soul.’ The Lord is my leader, my king. With him, I have all that I need: food, water, life itself and because of my king, the Lord, I fear nothing. THIS Shepherd is the source of everything. The third Sunday after Easter is called Shepherd Sunday and we always hear scriptures about the Good Shepherd on this week. There is mention of a shepherd in another place besides the psalm in our readings for today. In the gospel of John, Jesus says “I am the Good Shepherd.” In our text for today and beyond it just a bit, he uses gates, sheep and good shepherds as metaphors for his relationship with us. Since the early days of the Christian church, followers of Christ have read the 23rd psalm in light of Jesus’ words about himself, so that when we say the Lord is my shepherd, we are speaking of Jesus. But this is not the end of the psalm. The Lord, Jesus, Prepares a table before us in the presence of our enemies. In the very face of all that could harm us, he prepares for us a feast. Who are our enemies? Pain, loss, fear. Worldliness, resentment, anger. Failure, abandonment, illness. Death. And yet, our Lord, our shepherd and king, comes to us in the presence of the reality of these, our enemies, and tells us: Rejoice! For I am the Lord your God, the Holy One of My People, and YOU are my beloved children. I am the Good Shepherd and you are my sheep. I laid down my very life for love of you. I brought you out of your slavery to these enemies. I brought you through the troubled waters and oceans of tears. And now, even more than all these things, I bring you through death into life and I, the King of the Universe, prepare for you a banquet. I have defeated your enemies and claimed you as my own. I have bound up the broken hearted. I wipe away every tear from your eyes and I make all things new! So what does this mean for us? The Good Shepherd, our Lord and King, has laid down his life for his sheep. 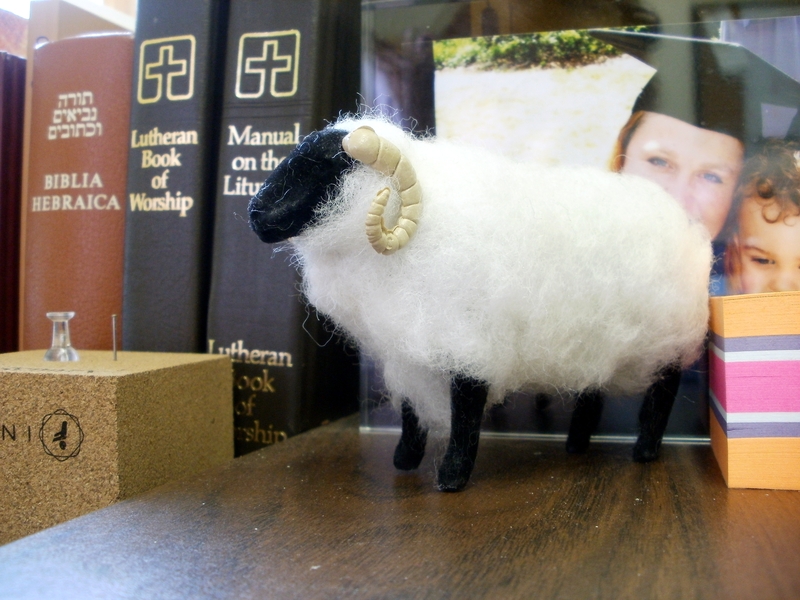 Who are his sheep—the sheep that know his voice? By virtue of our baptism, we are! If he has made us his sheep, and through the waters of our baptism we are his flock, then we follow where he leads us. Now that we are well fed and cared for and safe, is it so that we can graze at our leisure in the field and nap in safety? When we look at the whole story of scripture we can see that God saves and sets free so that something can be done. Freedom from fear, being saved from all that could harm us is never without purpose. Because with him we lack nothing, because he gives us everything—even his very life, because he protects us from our enemies, we can follow the Good Shepherd out into the world. Out to find those who do lack—those who hunger and thirst—those who fear—those whose enemies still hunt them. There are dark, sunless valleys to walk through, dark with fear, death and pain, and sometimes that may be our pain as well, but we do not need to make our home inside the fear because we are with the Good Shepherd. Are there sunless valleys right outside our doors? Are there hungry, thirsty, frightened people right in our neighborhood? Are there those who hunger and thirst for food? For comfort? For companionship and love? Are there those who have no one to tell them that the Lord is their Shepherd? Where is the good shepherd leading us? Where is our Lord and King leading you and leading me? Because he has given us everything, we can go freely and without fear to follow him into the shadowy valleys to reach out to those who also walk there but do so in fear. Whatever pasture we are in, still water we drink from or dark valley we must traverse, we can remember Jesus truly is Lord of All. The psalmist reminds us that he is also your good shepherd and my good shepherd. At that time, it was not very common for people to write hymns or prayers where they spoke in the first person and not as part of a larger group, but this entire hymn is a very personal praise of God. Jesus is, indeed, King of the Universe, but in that, he has not forgotten each of his sheep. Each of us need not fear because of all he has done for us. Jesus leads us, the church, into the sunless valleys, and he also leads you and me there as well. Following him through those dark places is not just the job of the wider church, our denomination, or other large groups. It is your job and my job too and he has freed each of us to follow him there. With Jesus as our Good Shepherd, our Lord and King, surely goodness and mercy will pursue us all the days of our lives. We can walk the dark and sunless valleys with others and not fear evil. Because he prepares a banquet for us, we can freely share our overflowing lives with others. Because he has defeated death by laying down his life for us, we can follow our resurrected Good Shepherd, Jesus, wherever he leads us without fear.